The laborious task of digging a trench has been transformed since the advent of the Trencher Attachment. 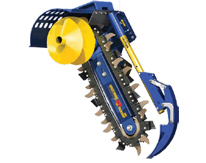 Auger Torque’s range of Trenchers cover depths up to 1.5 meters and widths up to 350mm, whilst spoil is piled neatly to the side of the trench by the integral auger. 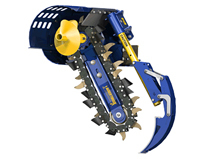 EXPERIENCE HOW TRENCHER ATTACHMENTS CAN MAKE LIGHT WORK OF YOUR CONSTRUCTION PROJECT – THE DAYS OF YOUR TRENCHING BUCKET MAY WELL BE OVER. Using only the highest quality hydraulic motors that allow flow rates of up to 150LPM and then amplified by Auger Torque’s own ‘bullet-proof’ planetary gearbox means that our trenchers have the reliability you need and the power to ensure your trenching is carried out with ease.